The Siege begins! The latest iteration of the ever-popular Generations line, War For Cybertron:Siege, has started to show up at US retail. 2005 board member GiganGoji has found Firedrive at his local Target in Washington. Firedrive, Blowpipe and Lionizer make up the first wave of Battle Masters which are the new $5.99 price point for the line. Each Battle Master turns into a weapon for a larger Transformer to wield and come with effect parts. You can check out the photographic proof after the jump. But that is retail for you… gotta check there every day since Brickseek is now useless. Right now for example I can go to any Walmart and see Dinobots, wave 3 Terrorcons, and G1 Devastator on the shelf at once…and they're not even the bulk of it which is Bumblebee movie & Cyberverse stuff. Hold on–could you clarify "upturn in size?" Everything is shrinking. The deluxes ESPECIALLY so (followed by the voyager figures). That's actually my biggest beef, with both Siege AND Studio Series. I mean seriously–people on this board in other threads have already taken to saying "new voyager sized" and the like because of it. I wouldn't mind the increase in costs due to materials/inflation if they didn't shrink everything down. Sculpted detail I will grant. But if you want to bring up the "extra" paint–that's another one. Where they dropped a lot of paint apps for cheap stickers, and now they're going back to the old paint amounts. So we call that "extra." 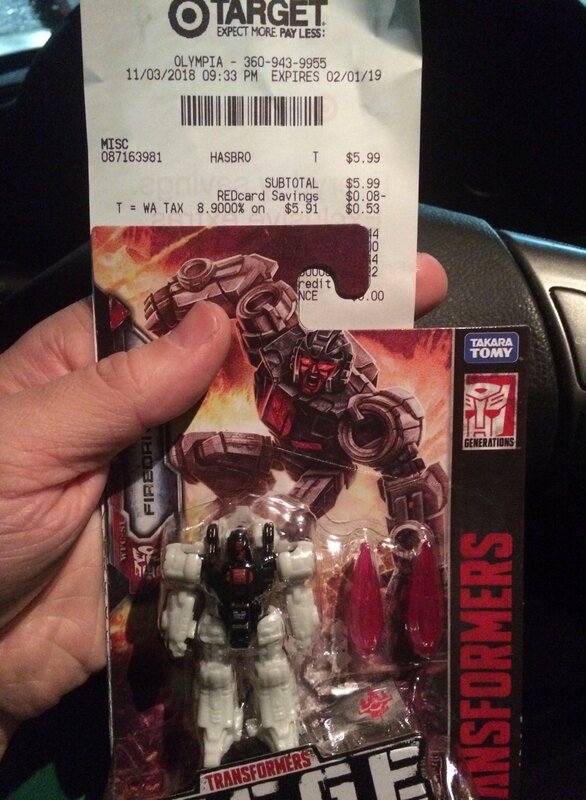 Sorry–there's inflation, and then there's Hasbro trying to see how much more they can charge for this stuff. Sometimes I can go 3 days without food. The only Transformer I need or want anymore is DJ Bumblebee, for my desk at work.